Counter Terrorism Policing is launching an thirteen-week ‘Communities Defeat Terrorism’ cinema advertising campaign on Wednesday 23 January. The campaign will now run until 28 April 2019. Aimed at a cinema audience, and designed to run during the trailers, the 60-second film will feature bespoke, localised calls to action in an effort to fully resonate with the viewers. Using cinema to deliver the campaign ensures the message is received with fewer distractions, more impact and to more hard to reach audiences, including younger people. 120 cinemas in nine regions across England, Wales and Scotland will showcase the film. The average cinema attendance in the UK across January and February is roughly 30million. This advert will hopefully be seen by hundreds of thousands of people who will then be better prepared to help police protect the UK against terrorism. We are inviting partners and stakeholders to promote the campaign and encourage the public to report suspicious activity. You can view, share and embed the ACT film from YouTube or Vimeo. Download the Video For Social Media. The Press Release is embargoed until 00:01 on Wednesday 23 January. New Videos, Images & Graphics are available to support the campaign. Please share the content with your digital teams. If you are unable to access the videos or still imagery via Box, you can download from WeTransfer here. Please note: this link will expire on 30th January 2019. Reporting it won’t ruin lives, but it might save them. If it doesn’t feel right, ACT. We’re supporting @terrorismpolice in working to keep the UK safe from terrorism. You can adapt our intranet news article for use within your organisation. 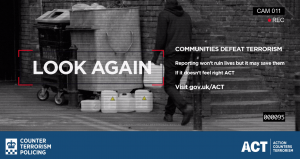 In March 2017, Counter Terrorism Policing launched ACT: Action Counters Terrorism, a branding platform that incorporates our counter-terrorism external campaigns to warn, inform and reassure the public. 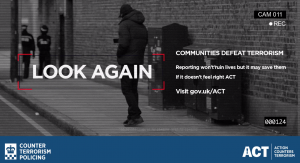 The Communities Defeat Terrorism ACT campaign aims to inform the public and encourage them to report suspicious activity. There have been multiple terrorist attacks in the UK resulting in a change of rhythm and tempo in police investigations. We must continue to educate the public about the different attack planning methods beyond ‘the suspicious package’ and encouraging them to help us stop attacks by reporting suspicious activity. Thanks to your support, during the March 2018 campaign, we saw intelligence from the public nearly double. We ran a four week online video campaign, which was supported by our partners across Government, local authorities, police forces, businesses and charities. Adapt our news story template for your website about why you’re supporting ACT and share examples of signs to spot and how to report. 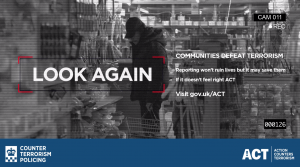 Share ACT: Action Counters Terrorism posters and graphics in your organisation’s building, display screens and public areas. Share our digital assets and creative film on your organisation’s social media accounts. The logos below can be used for promoting the campaign. We have also provided guidelines with helpful information on how to use the ACT logo and branding. You can download the ACT-Brand-Identity-Guidelines.